The Guest House is 50 meters from the main house Spazzavento. Recently built in the typical Tuscan style with exposed chestnut beams, terracotta tile floors and modern touches. The property enjoys spectacular views of Mount Amiata to the north, and the medieval village of Seggiano to the south. Olive groves, oak trees, fruit trees, flower beds and lawn areas make up the 4 acres of private land surrounding the property. Your stay includes use of the pool, shared with the 1-family main house. Situated at the rear of the main house, the lovely mosaic pool with outdoor shower echoes the natural contours of the land. This superb 'get away from it all' property is simply charming, offering a unique holiday in one of the least developed areas of Tuscany. Location: The guest house is surrounded by countryside, peaceful and secluded. However, it is also only a five minute walk down a country road to the medieval hilltop village of Seggiano, where you will find a supermarket, restaurant, bar and ice cream shop. It is located in the 'Montecucco' wine region, using the same highly acclaimed 'Sangiovese' grape grown in the world famous 'Brunello' vineyards of Montalcino, (20 minutes away by car.) The majority of food found in the restaurants and shops is farmed locally; roast meats, fresh pasta, porcini mushrooms and pecorino cheese are particular local favorites. There are plenty of trails for leisurely walks and hikes in all directions. What is it like? : This gorgeous Guest House, (1,700 sf,) built on 3 levels, with large exposed chestnut beams, stone walls, terracotta and wood floors, features the following rooms. MASTER BEDROOM: queen size bed, walk-in closet, en suite rain shower, bidet, beautiful view of hillside town. 2nd BEDROOM: queen size bed, walk-in closet, soaking tub, bidet, private porch area, lovely valley views. 3rd BEDROOM: full size bed, access to second bathroom adjacent to kitchen with shower, windows on 4 exposures. LAUNDRY ROOM for your convenience. KITCHEN features modern Bosch appliances. The GARDENS are very private, on two elevations with flowers and grassy areas. Beautiful mosaic POOL with hot outdoor shower. The property is ideal for 2 couples or a family, where everyone can relax, enjoy the breathtaking views, explore the surrounding countryside and charming Tuscan towns. Watch the sun set over the mountains from the terrace. Experience a truly relaxing Tuscan experience. About the area: The magnificent mountain of AMIATA (1750m) once the sacred mountain to the Etruscans, is perfect for summer picnics and winter skiing. During the season fresh porcini mushrooms grow along the mountain trails. OR try the rejuvenating hot springs, of Bagni Vignoni, Petriolo, and San Fillipo to unwind. Enjoy the local olive oil internationally acclaimed with its very own DOP. The GUEST HOUSE is a wonderful place to relax in between seeing the famous sights of MONTALCINO, SANT ANTIMO, PIENZA, MONTEPULCIANO and SIENA. The area is unspoiled and still a habitat for wild flowers, birds and animals such as boar, porcupine, badger, hare and deer. The Tyrrhenian coast is an hour drive if you want to enjoy a day at the beach; the sand and sea are some of the cleanest in Italy. This house looks like a traditional stable converted to an holiday home. Yet it was build only 5 Years ago from scratch to a high standard. We like the style - kind of italian with a touch of english country style, elegant yet easy going. We did not miss a single thing and felt at home almost instantanously. Beeing just two of us we had plenty of space but thats how we ike it. Jennifer was a gentle host and very wellcoming. The surroundings are rural Tuscany which is to say narrow roads which sometimes make you wonder if they lead anywhere at all. But then you are close to Monte Amiata with the art fundation of Daniel Spoerri, several sulphuric springs and the many old villages perched on hill tops. It is not too far from Grosseto, Siena or the sea. For us it is the perfect hide away to wind down, relax, do some creative work. First thing back home we made arrangments to go back. This was a lovely house- much more spacious than the photographs can do justice to. The eating terrace with views to Seggiano was a delight and it is beautifully tranquil. Jennifer the owner was very helpful and the restaurant in the village at the bottom of the lane was simple but good. Definitely recommend it. We were two families visiting from Australia and USA and we spent 5 wonderful days in Tuscany in August 2013. The Guest house was exactly what we were looking for - large enough for six and tastefully furnished, with quality appliances and furniture and providing privacy for each of the families. The cupboards were stocked well with cutlery and plates. The property was well positioned - providing both privacy and close proximity to the shops in Seggiano - easy to get to the shops on foot. Plenty of hills around to explore or run and heaps of blackberries alongside the road we enjoyed. While staying at the guest house, we explored Tuscany - beach was about 1.5h away, Florence not too much further, as well as Siena. The main restaurant in the village offered good quality Italian food and served a great tasting rye bread. Jennifer is a wonderful host - gave us directions to where we wanted to go, suggested good beaches and made sure we had a perfect holiday. Thank you Jennifer! - while the weather was warm, almost hot, the house provided good relief from the weather, we did not need air conditioning. Overall, I would recommend this house to anyone that is looking for a holiday place that gives quality and comfort, supplemented by picturesque views. Our last summer vacation was one of the best we ever had! Certainly, we are not exaggerating by saying that everything was just perfectly fine. The house is a wonderful place to stay - absolutley well furnished and clean. The same applies to the big garden and to the nice pool being the best place to relax and to pass sunny hours. Besides we were so warmly welcomed that it felt like home. We are definietley coming back one day! 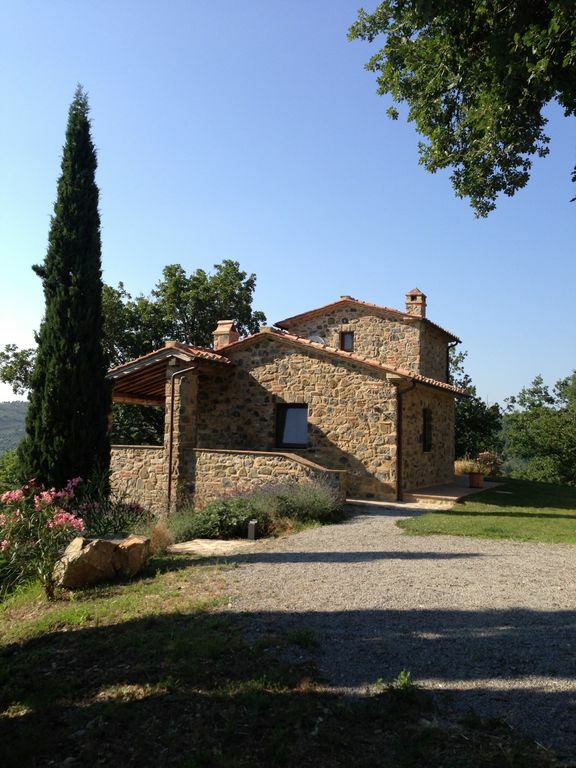 So we may recommend this guest house to all people loving Tuscany! Thank you for your great review, I'm very happy that you enjoyed your long holiday (19 days) in the Guest house, and hopefully you will return.....I really enjoyed your delicious biscuits and homemade jam! This spring we stayed with six person (two adults and four older children) two weeks in this beautiful place. We enjoyed it very much even though we had unusual cold weather. The house is very tasteful furnitured. The beds are comfortable. The kitchen has got everything which is needed. The whole place (house and garden with the swimming pool) is extraordinary beautiful and pitoresque. Jennifer is an extremly friendly landlady. She was always there if we had a question or needed help. Seggiano is a romantic village. Even so it needs some twisting driving to get there it is worthwhile. We and our children simply loved the place. Most important first: we (two couples) had a wonderful time at this well equiped and beautiful guest house. We really enjoyed the view from the balcony (seggiano across the valley), the fantastic landscape and the rest and receation at the nice and clean pool. Lots of good restaurants are just a few car-minutes away and Jennifers recommodations were very helpful. Thanks so much for your review, I hope you will come back it was great meeting you.